Hope you're all well! One thing that I'm loving about summer are the fashion trends. I feel like these trends are far by my favourite and very different and experimental. I would've never worn half the styles this time last year, but with these trends becoming so popular, I thought I'd give it a try! 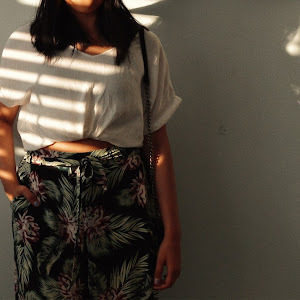 For this blogpost, I've narrowed down my list to the top 4 summer trends that I'm loving, and I tried to style them all in one outfit! Embroidered clothes have taken over all the shops this spring/summer, and it is by far my favourite trend. 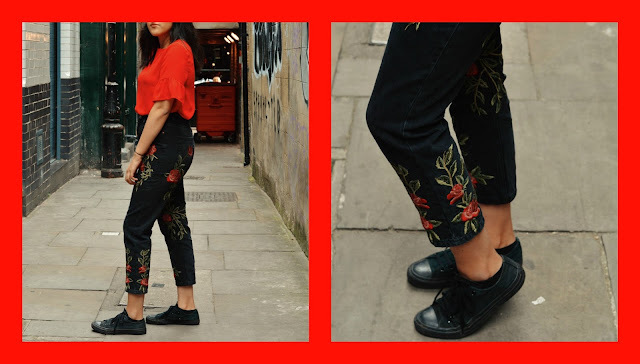 I found these high waisted mom jeans with these lovely red rose embroidery and I fell in love. Love at first sight truly exists. I love that the jeans are black which helps to bring out the red embroidery a lot more. I feel like these jeans will be very easy to style and can be worn throughout autumn as well as they're quite thick. I wore these on a gloomy day, and they were perfect to add a bit of colour to my outfit! Red is probably the go-to colour this summer. From red dresses, to red shoes, it is definitely this seasons favourite colour. 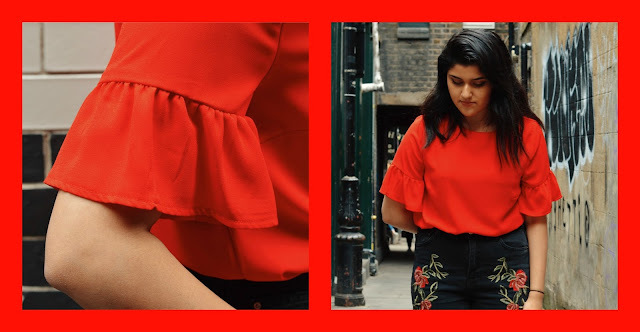 Red is probably also the one colour I lack in my cupboard, so it was nice to add more vibrance to my clothes! You'd think red would be a hard colour to style, but it goes well with any kind of jeans! For instance, a red blouse tucked into a blue buttoned skirt! It's a great colour to stand out this summer. Above I've styled the jeans with a bright red blouse. 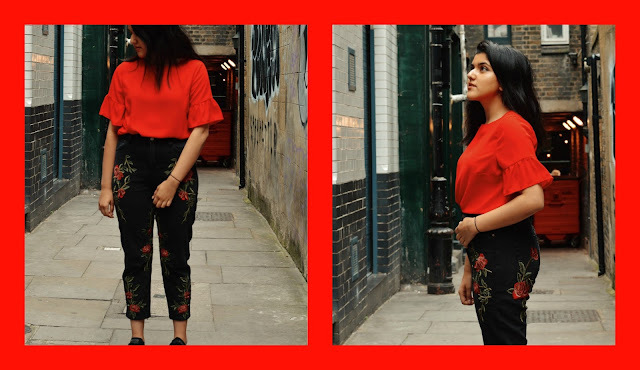 I think that the black and red go really well together, and the blouse also matches with the roses on the jeans! If I were to wear a black top, I think that the outfit would look more muted. The red blouse really ties in the look together! The third trend I've been seeing around are frills. Now, this is something I didn't think I would wear and To be fair, when the trend first started to come around, I wasn't a big fan of it. However, the more I saw it around, the more I started to like it. I'm not a big fan of clothes that are overly packed with frills and ruffles, I prefer simple ones like the blouse I'm wearing above. Frills and ruffles help to bring character into your outfits and also gives it a vintage vibe. Frills and ruffles were so in fashion before, and I'm glad that they're back because I got to try something new for myself! Denim on denim is quite a risky trend for me, because I think that it has to be styled in a certain way for it to look good. One thing I've been noticing this summer is the style of matching denim jackets with denim jeans. I''m really loving the denim on denim trend! 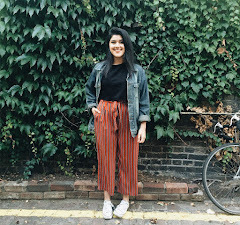 Here I've styled a black denim jacket, with frayed hems, with the black mom jeans. Here is an overview of the outfit! I styled the outfit with some black converses to keep the attention on the jeans and the red blouse. 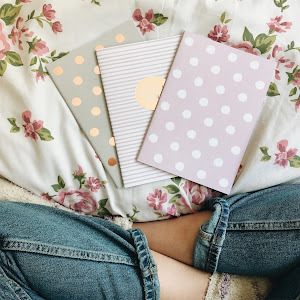 I hope you liked this blogpost! I love this seasons' fashion and I'm looking forward to the upcoming trends! i'm so here for the frills and ruffles trend i think everything looks so pretty! I absolutely love this outfit! These are also some of my favourite trends!